After a long, hot summer, Labor Day 2008 in Richmond starts off with a taste of crisp, cool air. Air that we have not enjoyed for several months. My spouse and I are eagerly anticipating this weekend hiking trip to the George Washington National Forest in western Virginia as we pack our hiking gear and our two happy, naughty puppies into our CRV. Two hours later, we arrive at the trail head parking lot for our first of two day hikes. It is Ramsey’s Draft, an 8.3-mile hike in the forest. Over the years, I have become accustomed to an oddity in America: Hiking or paddling a gorgeous location, and noticing not a single person is at the destination doing the same thing. I am exceptionally grateful for the peace and solitude, but where on earth are others? Why is this location not crowded with other hikers or paddlers? Ah, well. Their loss is my gain. Ramsey’s Draft trail is wonderfully pretty. Well-maintained. Easy to hike. Moss and grasses line the path. This trail starts out being easy to follow, despite an absence of trail blazes. 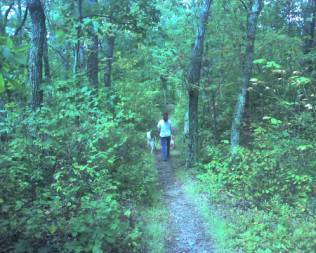 It also starts out by following a portion of the Appalachian Trail. 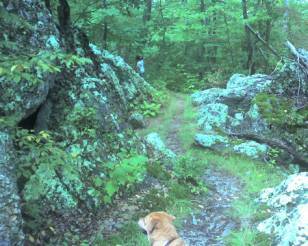 Despite the cool air we started out with in Richmond, the trail soon becomes hot and steamy. Note that one finds very little water on the first portion of Ramsey’s Draft which, at the time we are hiking, may be at least in part due to the long drought that Virginia has suffered in 2008. The trail book that led us to our trail uses words I am not familiar with in hiking. The description of the trail refers to “drafts”. And “draws.” But as we hike the trails, we begin to understand. Apparently, a trail “draft” is a stream. And as far as we non-Appalachians can tell, a trail “draw” is a slope pulling/drawing back to the mountain so that the trail forms a “U” shape as it negotiates this pull back. The first mile of Ramsey’s Draft is noisy due to proximity to Highway 250. However, after this first mile, the trail and the highway are remote from each other, and we enjoy a pleasant, silent hike for the rest of the 4.5 hours of hiking. My spouse is disconcerted. I’m excited. You are “on your own” on this hike in the sense that more than once, one must cross a rocky creek and find an often hidden trail on the opposite side of the creek bed. Fortunately, previous hikers or trail maintainers have set up stone “cairns” to guide us. To assure us that even though there is little visible evidence of a trail in front of us that we are on the right track. Again, without trail blazes, the cairns meant that we had reassurance. Despite the cairns, however, we felt we had lost the trail two or three times, only to have it re-appear in 100 meters or so. We learn that another challenge for the hiker of this trail at this time of year is that we find ourselves having to contend with a continuous, relentless cloud of gnats swarming around our heads. So much so that I often found them getting caught in my eyelids. Putting on sunglasses, and walking at a brisk pace, provided some relief, however. Mercifully, the gnats don’t bite. But endlessly needing to swat them away gets old. Adding to the challenge of staying on the trail in the final three miles of Ramsey’s Draft is the need to negotiate several fallen tree trunks across the path. In addition, this portion of the trail features a Virginia form of stinging nettles, which provides the hiker with the minor annoyance of several minutes of painful itching on lower legs. 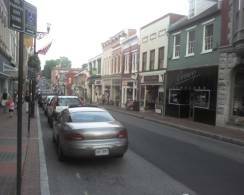 We end our first day by walking the very charming, historic downtown streets of Staunton VA. After a delicious Italian dinner, we walk the romantic streets and enjoy the ornate downtown buildings. On Sunday, we drive a few miles east to arrive at RipRap Hollow Trail along the famous Skyline Drive. This trail is 9.6 miles long. On the trail, we find a noticeably smaller population of gnats. And more hikers (we had seen not a single hiker on our full day of hiking Ramsey’s Draft). Once again, the trail is simply gorgeous. Spectacular valley views (there are three spectacular viewpoints facing out into a mountain valley – a great place to stop and eat lunch on large boulders). And scenic path routes down into forested creek valleys. This trail provides the reassurance of trail blazes. At about mid-point, RipRap Hollow rewards the hiker with a series of waterfalls along a small creek. This terminates at RipRap Falls. And the falls empty into a lovely, crystal clear, ice cold pond. 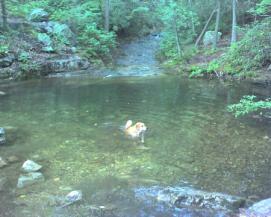 A fantastic spot to stop to cool off (and if brave, to go for a swim). In all, it takes us 5.5 hours to hike RipRap Hollow. It is our second consecutive day of superb day hiking. It should be pointed out that we noticed a sprinkling of what appeared to be pleasant, primitive camping sites on both trails. The mileage of the two trails was a bit less than what we would find desirable for an overnight hike, but if one was seeking to spend two days slowly taking in and enjoying the forest without covering lots of trail miles, both of these trails could be attractive overnight options. Overall, we found that both trails pass through an astonishing volume of fallen, often sharp, rocks, which adds to the interesting character of hiking these two trails. Their proximity to each other gives hikers the opportunity to easily combine two highly enjoyable day hikes on a two-day weekend of hiking.